Fill out the form below to request a quote. Our Arctic Travel Experts will be in touch with you within 24-48 hours, and are happy to answer any questions to help you book the perfect Arctic experience for you. Stay in a charming, rustic lodge overlooking Great Slave Lake. Lying within the Auroral Oval, this quiet and secluded location gets you as close as any earthbound spectator ever gets to the Northern Lights. Engage in a variety of winter sports and activities, including snowshoeing and crosscountry skiing. Relax by the lodge’s fireplace, or in the sauna and hot tub. ESCAPE THE CITY AND WITNESS THE MAGIC OF THE NORTHERN LIGHTS ON THIS BUCKETLIST EXPERIENCE. 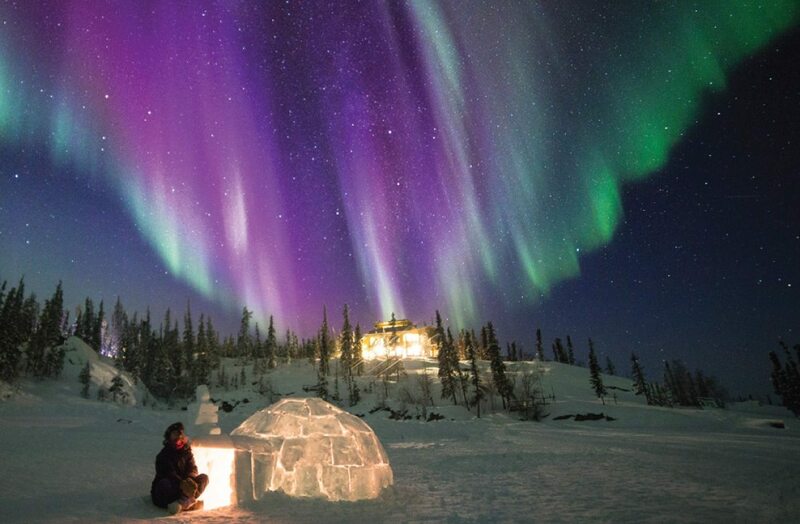 Yellowknife is one of the best places for trips to see the Northern Lights (Aurora Borealis) in Canada. 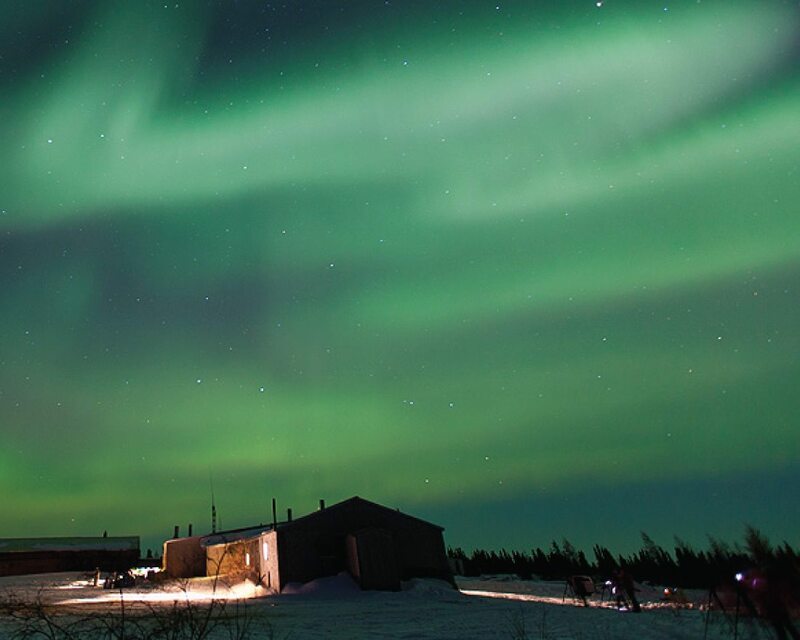 Set deep in the Canadian wilderness, away from the bustle and light pollution of the city, you’ll get a front row seat to watch the dancing lights across the night sky in this remote and rustic lodge. Spend daylight hours taking in spectacular scenery and enjoy a variety of outdoor activities before settling in at night for one of the most unforgettable light shows you’ll ever witness. Starting at CAD $2,766 (+ 5% tax and 10% gratuities). See packages for details. LATE DECEMBER 2018 TO MID-APRIL 2019. ALL PACKAGES INCLUDE A STOPOVER IN YELLOWKNIFE TO AND FROM THE LODGE. NIGHTS WITH THE NEW MOON ARE CONSIDERED THE OPTIMAL TIME FOR VIEWING. Some guests prefer to plan their stay around the new moon dates, however, any stay during the winter months will provide great opportunities to view the Northern Lights. JUNE TO MID-OCTOBER 2019. ALL PACKAGES INCLUDE A STOPOVER IN YELLOWKNIFE TO AND FROM THE LODGE. * All package prices are per person in Canadian dollars. * All prices are subject to 5% GST. *Credit card payment subject to a 2.5% processing fee. * Prices include return airfare if a Friday or Sunday scheduled flight is used. Additional charges apply if flying on a non- scheduled day. Rates available upon request. * For single supplements, please add 25% to the package rate.